Wright’s bold blend of contemporary jazz and traditional liturgical music developed through his research on the work of 17th-century composer Giovanni Anerio, who — 400 years ago at the very same church — similarly surprised and delighted crowds with secular riffs on sacred song. The music of “Drama and Devotion” is organized around five biblical scenes, which are inspired by Easter Vigil Mass readings: Abraham and Isaac, the parable of the Prodigal Son, the crucifixion, the resurrection, and St. Paul’s conversion on the road to Damascus. Whereas Anerio popularized vespertino prayer services at Chiesa Nuova by infusing musical responses to Scripture readings with the madrigal tunes of his day, Wright’s compositions introduce jazz improvisation as counterpoint to more traditional sacred music. The Notre Dame Children’s Choir brought this dialogue between past and present to life for Wright during the launch of O, Emmanuel, his bestselling 2016 Advent and Christmas album that debuted at No. 1 on Billboard’s Traditional Classical Albums chart. Wright’s artistic and scholarly path combining jazz and sacred music may have surprised him most of all. “While I was raised Catholic, loved the music, and wanted to contribute something of my own to the Church, I ended up playing jazz exclusively through high school, college and in my time in the military with the Naval Academy Band,” he said. After graduating from New School and applying to graduate programs while working as a church music director to support his family, Wright assumed he would need to let go of jazz in order to pursue sacred music. Margot Fassler, Keough-Hesburgh Professor of Music History and Liturgy and director of the Sacred Music at Notre Dame program, relieved Wright of this notion when he arrived in her graduate class on liturgical prayer. “J.J. 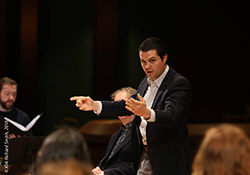 Wright is the kind of musician Sacred Music at Notre Dame hopes to train: highly skilled as a musician, pastoral in his outlook, and entrepreneurial in his determination to serve academy, Church, and community,” Fassler said. 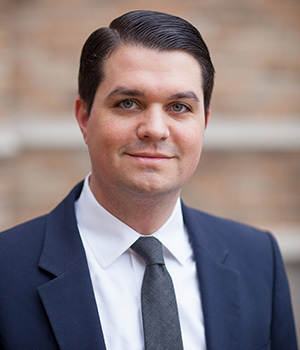 Wright is the recipient of the Dominica and Frank Annese Fellowship in Graduate Studies from Notre Dame’s Nanovic Institute for European Studies in the Keough School of Global Affairs. “The Institute is excited to support a student so immersed in the global nature and history of the Catholic church that he is in a real position to contribute something new,” said Anthony Monta, associate director of the Nanovic Institute. The Chiesa Nuova premiere of “Drama and Devotion” is made possible through a partnership between Notre Dame’s Rome Global Gateway and the Pontificio Instituto di Musica Sacra and will feature a combined chorus of students from both institutions, as well as the NYC-based jazz ensemble Endless Field. The lecture and concert will serve in partial fulfillment of Wright’s doctorate of musical arts degree; both are free and open to the public. Wright will assume the post of director of the Notre Dame Folk Choir July 1.